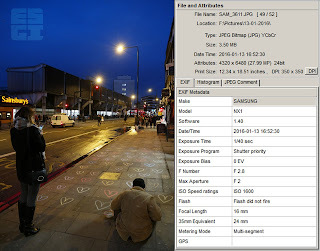 One would presume that you all know what EXIF data is (but for those who don't); when you import digital photos you have taken into your computer for editing you may notice a window showing information like the shutter speed used, the aperture, exposure compensation, white balance and the like. As you can imagine, this information can be extremely useful. Not only for seeing what settings you actually used but also for seeing what worked and what didn't, also for being able to sort images by ISO or shutter speed, if you need to for some reason. 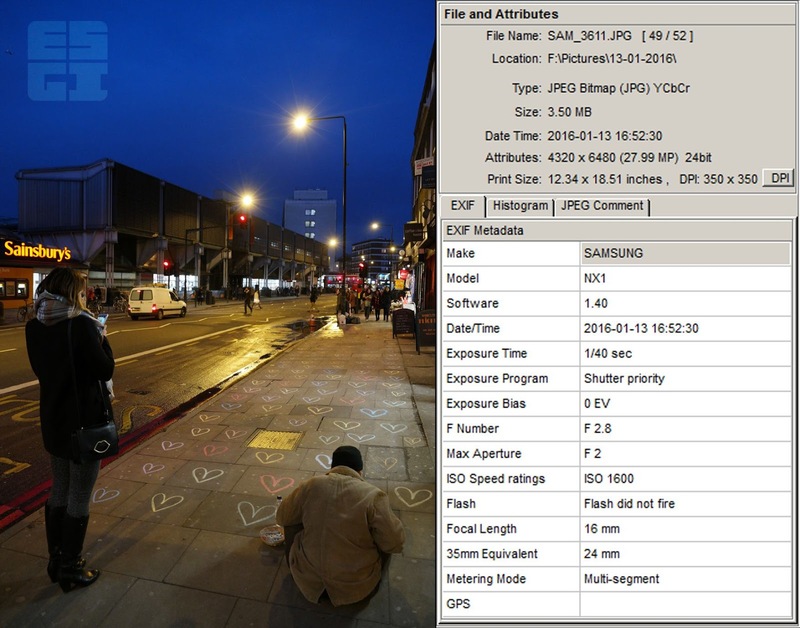 In digital cameras, EXIF has been around since about 1998. You can get something similar for audio files which lets you view the copyright information, recording artist, producer, year of release and so on. As you can imagine this 'added information' extension is also available for video files. Anyway the important thing is you can still get at it. How? Watch my latest 60 second video on the 'Samsung NX1 Hints and Tips' series below to find out! You would be surprised how challenging it is to fit this kind of thing into sixty seconds. Challenging, but fun, and informative. Remember to like the video if useful and to subscribe to my YouTube channel for more info! The results and an extensive analysis of the formal subjective verification tests of the H.265/HEVC video compression standard are published in the IEEE Transactions on Circuits and Systems for Video Technology (TCSVT), January 2016. BBC R&D video coding research team focused on evaluations of UHD content and definition of analytics as part of standardisation process and presented in this paper. The High Efficiency Video Coding (HEVC) standard has been developed jointly by the two standardisation bodies ITU and ISO (as has been the practice with all major video coding standards in the past 3 decades); in this instance as the Joint Collaborative Team on Video Coding (JCT-VC). The main goal of the process was to provide significantly improved video compression compared with its predecessors; H.264/AVC being the most recent. HEVC standard was ratified in 2013 as H.265 by the ITU-T and as MPEG-H Part 2 by ISO/IEC. The associated formal subjective verification tests leading to the results presented here were carried out on behalf of the JCT-VC in Feb/March 2014.